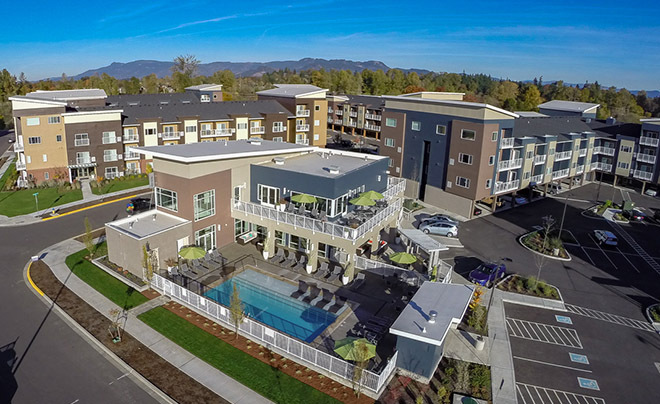 HFO Investment Real Estate (HFO) has sold the 272-unit Riverwalk Apartments in Eugene, Oregon for $43.1 million. Riverwalk is a luxury lifestyle asset with resort-style suburban amenities which was developed by BPM Real Estate Group, of Portland, Oregon. Completed in 2015 and fully leased up in 2016, the property is one of the very few newly built apartment properties in Eugene. Riverwalk offers unique amenities, and an urban setting combined with immediate access to 150-acre Delta Ponds City Park. The apartments are close to a bike connector leading to the 12-mile bike path along the Willamette River. The sale represented a price per unit of $158,456 | $205.21 per square foot. The seller was Alexander Loop LLC of Portland, Oregon, that was owned by a partnership managed by Walter C. Bowen. The buyer was Green Leaf Riverwalk of Danville, California. Utilizing its national market reach, HFO garnered significant interest in the asset from investors across the country, particularly in California, Arizona, Utah and Illinois.